Ludhiana, October 03, 2018 (Team Online News India): Mirza Ghalib would have approved of it. Shah Jahan would have been one of our frequent customers. After creating sensations in Delhi and Gurgaon in last 15 years, Not Just Paranthas (NJP) forays into Punjab with opening of their outlet at Pavilion Mall in Ludhiana where people of city will now get the best taste of its history. Inspired by the famed Paranthewali Gali in Delhi, NJP has created a unique cuisine in itself, exhibiting mouth-watering collections of the finest traditions of Indian cuisine which of course includes paranthas and the kebabs. The restaurant boasts of a live kitchen and a menu that consists of more than hundred varieties of paranthas. Paranthas that’ll amuse and pamper your taste buds, in an ancient way. We have not only recreated the glorified past of Indian culture, but given it a unique twist of taste. With reviews from Michelin starred chef Vikas Khanna to almost every media house in Delhi NJP in last 15 years have created a unique name for itself. 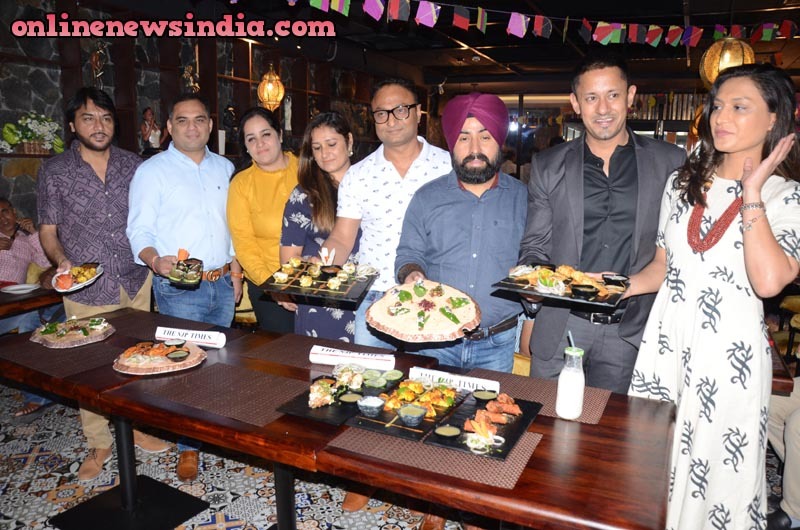 “I can’t twist a menu already twisted to the best” were the comments by chef Vikas when he covered NJP in its international show Twist of Taste. NJP very successfully has revived the glory of Delhi’s traditional cuisine that have been long forgotten and ignored by time. not Just paranthas is the rebirth of a bygone era, a journey back to our roots, to our age-old culture,” says Varun Agarwal, the Managing Director of NJP. NJP was made for Punjab, the heart and soul of paranthas, exclaimed Mr. Gurinder Singh, Mr. Harish Sharma, Mr. Rajeev Gandhi & Dr. Amit Sachdeva, who have brought the Franchise of NJP to Ludhiana at Pavilion Mall. With many Industry first, and an unique cuisine, we are ready to take Punjabby storm, So, while you dig into the luscious paranthas let the rejuvenating atmosphere take you to ecstatic heights. The strongest point of NJP however remains the food. not Just paranthas is perhaps the only place in the world where you get a 100 different choices of paranthas. NJP is a kitchen full of inventors. With Never heard of products and fascinating gourmet fusion food, not Just paranthas has redefined the art of Parantha makings. From Mirch Lehsuni Paranthas to Prawn Paranthas and exotic paranthas such as Sharabi Paranthas (served flambéd - one and only of its kind), and Kebabs in a Pocket Paranthas, NJP has it all, besides the ubiquitous Aloo Parantha. For the palates who are inclined towards the Western taste, not Just paranthas has included Pan Parantha Pizzas, Italian Calzone pizza paranthas, Mexican quessidilla parantha and continental sandwich paranthas to name few, in its big booty. NJP has also introduced melt in mouth Rabri parantha and Paan parantha to finish your meal. NJP not only serves gourmet food which is tasty, but which is healthy too. With a great focus on Healthy India, not JUST paranthas introduced “Diet Paranthas (prepared with olive oil and chakki atta in clay-oven). Now to take it a step further Team NJP Developed very unique 8 grain flour, which is gluten free and very high in protein for the people who care after their waist inch. Utmost care has been taken to preserve the authenticity of all the culinary delights. The restaurant ensures a relaxed environment to give its patrons a very fine dining experience. The interiors of NJP have been designed by Bhavna Agarwal. Bhavna Agarwal is an interior designer of fame whose past achievements include the designs of a number of L’Oreal Salon, Ambika Pillai Salon, Le Meridian Salon, and a huge number of Restaurants across India and Australia. Worth mentioning here is the “Manual on Beauty Salon”, the one and only manual of its kind written by Bhavna Agarwal. With a regal aura to it, the interior oozes with the culture of the Purani Dilli,and a heart of punjab. The ambience evokes a nostalgic feeling with the many historic artifacts that have been woven into the restaurant. On the way to success NJP has broken several records. NJP has sold over one billion of Its signature multigrain utterly butterly delicious Chur Chur Parantha in Delhi alone, and now is Punjab’s turn to break this record. This is best relished with thepir 21 hours slow cooked Dal Makhmali. Some of the paranthas found here are almost extinct today. NJP has given a new lease of life to these exotic paranthas, which has been a result of extensive research done over a period of 15 years, the result of which is fine paranthas. While maintaining the original taste and feel of the paranthas standards of quality are never compromised. Similarly, the other dishes and desserts too are authentic to the core. “not Just paranthas has created its cuisine in such a fashion that you savour not only the paranthas but also sweet delights like Kulfis and Chuskis apart from other Mughlai, North Indian and Pakistani delicacies. It is our effort to conserve our heritage in our own unique way,” elaborates Varun. Experience this journey down memory lane and let culture take control of your palate as you immerse in the old-world charm and true ethnic cuisine that not Just paranthas serves with pleasure. Take part in this celebration of paranthas and relive the golden era of Delhi.